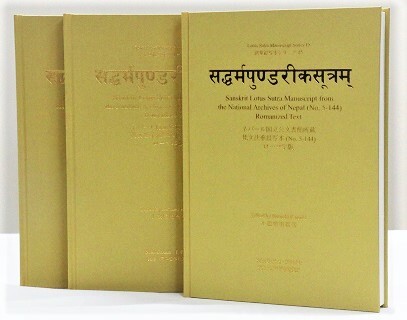 Since its first publication of Sanskrit Lotus Sutra Fragments from the Lüshun Museum Collection, Facsimile Edition and Romanized Text in 1997, our projects on textual studies have been carried out through three periods with the aim of publishing a critical edition of the Gilgit-Nepalese Sanskrit Lotus Sutra. This book, Sanskrit Lotus Sutra Manuscript from the National Archives of Nepal (No. 5-144), Romanized Text (N3 for short), is the first output of the third-period project. The manuscript begins with Rāhulabhadrasya Saddharmapuṇḍarīkastavaḥ (Rāhulbadra’s Tribute to the Saddharmapuṇḍarīka) on folio 1 (missing) and ends with folio 120, which includes a part around the beginning of chapter 26, “Encouragements of the Bodhisattva Universal Worthy.” Folio 121 and those thereafter are missing. The folios preceding 120, however, are not all in good condition. Many are seriously damaged, and some are missing. As a major characteristic of the study, along with the N3 manuscript and its Romanized text, four different copies of the Gilgit manuscripts (ca. 7th century C.E.) and 15 divergent copies of the Nepalese palm-leaf manuscripts (ca. 11th-13th centuries C.E.) were also carefully examined. After the frequency of text accordance between N3 and the other manuscripts was confirmed with a multivariate analysis technique, the data was finally rendered into graphs. With this new technique, the similarity rates that appear in the graphs help readers easily determine which groups the respective manuscripts belong to and understand how these manuscripts shape groups. It is academically significant that the publication will open a new horizon for study on the Lotus Sutra.